Babblings of a Mommy: Dive Into Spring With Target Swimwear. Dive Into Spring With Target Swimwear. It may not feel like it with winter storm Saturn still looming, but Spring Break is right around the corner which means you might be in the market for some chic swimwear. 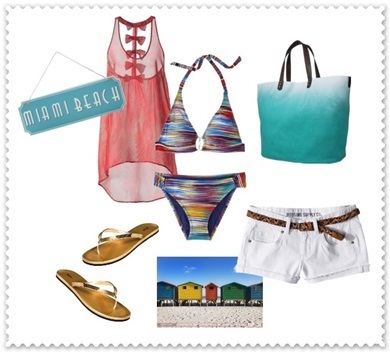 Whether you’re more Miami or St. Tropez, Target has a fabulous selection of swimsuits to fit your style. I spotted this fun Mossimo multi-color two piece that would be great to show off a svelte body. I paired it with an Xhilaration racerback coverup, and Mossimo belted shorts. Then finished off the look by adding some warm weather essentials like these Mossimo mirrored flip-flops and this green tie-dye tote bag for a casual day at the beach. If you’re like me and feel more comfortable trotting around the beach in a one-piece, this Merona black print swimsuit is fabulous! I paired it with a Converse deep v coverup and some killer Mossimo tribal wedge sandal (that may or might not be great for the sand, but look fabulous anyway, so who cares?). Then what fashionista’s look would be complete without a good floppy hat like this one from Merona, and an amazing set of sunnies from Mossimo. Just remember when choosing your swimwear look for something that you look and feel good in. You don’t want to spend your precious time in the sun worried about how you look, instead of achieving that perfect sunkissed glow. Target always has great options! I like the second look best.